A nice looking new phone, the Serenata, has recently been announced. 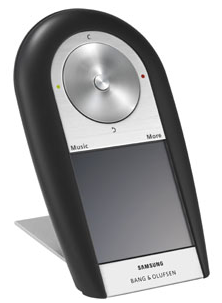 The Serenata Music-Phone is a joint development by Samsung and Bang & Olufsen. Bang & Olufsen's expertise in concept development, user interface experience, acoustic sound capabilities and design skills together with Samsung's leadership in mobile phone technology, engineering and quality have realized a new way of combining unique music and mobile experiences for consumers. To assist the user, the display changes color depending on whether it is in Phone mode (blue) or Music mode (red). Furthermore, the large 2.4-inch color LCD display developed by Samsung allows Serenata to show album covers in an excellent resolution and facilitates on-screen navigation. Also, the innovative mobile phone features sensi-touch to enhance the usability.